Kasedo Games' futuristic RTS Mechs & Mercs: Black Talons, the tale of a mercenary company trapped on a planet overrun by enemy forces, (who are also mechs and mercs, but crucially wearing different outfits), is now available on Steam. And because no game launch is complete without an accompanying trailer, the publisher has also released a new video that showcases both gameplay and cinematics. Cue the giant robots! 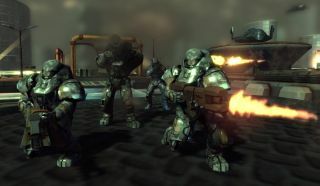 According to the description on Steam the game sees specialized unit classes with unique weapons and abilities battling across five different worlds, each with its own environments and weather conditions, while bases can be customized and upgraded with weapons and infrastructure that will provide boosts and additional abilities to squads in the field. Relations with various factions influence progression, and the player's actions have a "direct impact on the local system's balance of power." It's single-player only, which is kind of unusual for the RTS genre, but it doesn't take a whole lot of hardware to run—the recommended spec is a dual-core CPU at 2.4GHz or higher, 4GB RAM, and a GeForce 8800 GTX—and it offers Steam trading cards and achievements, which are always nice. However, the user reviews, to use Steam's own parlance, are "mixed"—almost perfectly so, currently sitting at 20 positive and 19 negative. That's hardly a ringing endorsement, but there actually seems to be a good bit of common ground between the two sides, including comments/complaints about the high degree of difficulty, spotty AI, and some rough edges that will hopefully be smoothed down in future patches. Mechs & Mercs: Black Talons is available until January 16 for 15 percent off its regular price of $20. A boxed version, for those who you who enjoy such things, comes out on January 23.